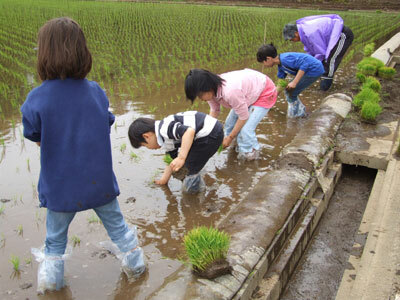 Today we got to see what it is like to plant rice in a rice paddy. Some of our neighbourhood farmers were kind enough to leave one section of a rice paddy unplanted so we could come and plant it ourselves. First, we had to get our “super-special plastic bag boots” on. Mr. Kano came up with the idea of covering our legs with these boots so we wouldn’t get too wet or dirty. 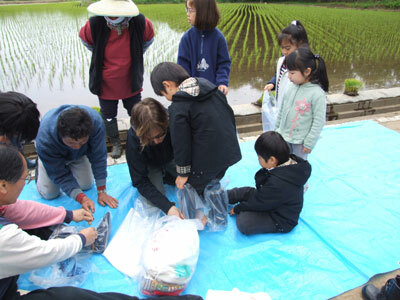 Then, we got into the rice paddy and started planting. 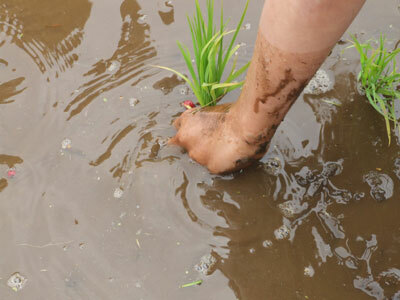 Have you ever wondered how farmers can make nice, straight rows, even when they don’t use a machine to plant the rice? Well, we discovered the secret today! The farmers strung up a wire with red beads on it at equal distances apart showing where we had to plant the baby rice plants. The wire was in the water, so we had to look carefully to find it. (Can you see the bead just in front of the plant in the picture below?) 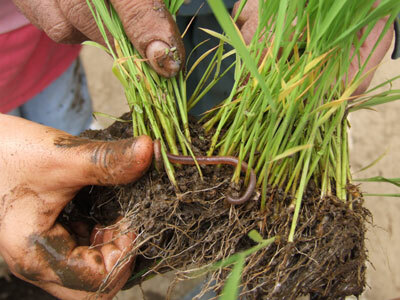 As long as we planted the rice in the place where the bead was, we could keep our lines straight. Once we finished planting one row, the farmers moved the wire back towards the edge of the field and we started planting the next row. We planted about six rows in total. As an added bonus, we found a worm in one of the plants! We are excited to see how our plants grow over the next few months!